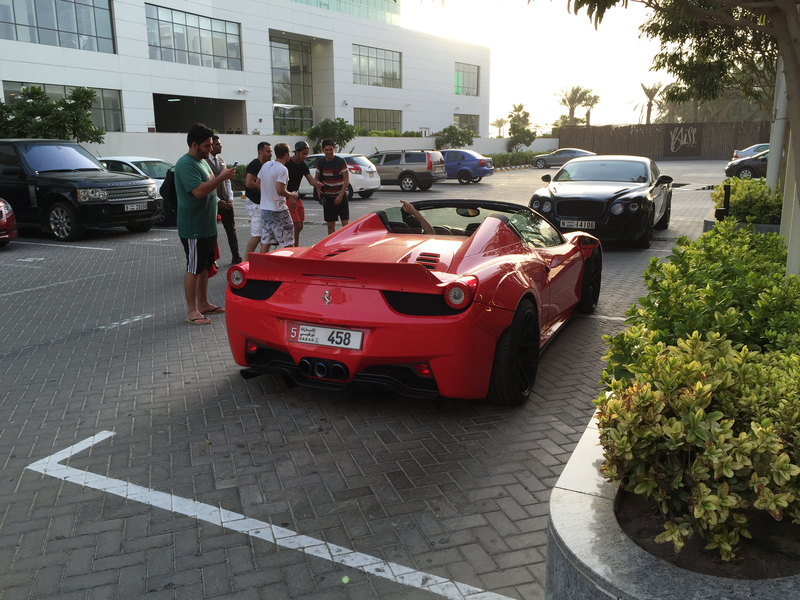 On a recent trip back to Europe I stopped off in Dubai for a night to break up a long journey. In the evening after dinner as I walked back to the hotel with my wife, I spied a couple of interesting motors in the driveway. One was a Ferrari 458 with what I thought was a home grown body kit cobbled together. It looked horrid and frankly in my opinion ruined the car. I was later surprised to find that this is a body kit that can be bought for a number of vehicles and made by Liberty Walk. For the 458 Italia the full body kit comes in at around $30,000 – which in my opinion is $29,990 too much. That rear spoiler does just that – it spoils the looks of the car. The reason it looks tacky is that it is simply bolted on – or gives the impression that it is fixed this way. Race teams have modified road cars for 60 years with better results. If the edges were smoothed out and the bolts covered up, I would give it a bit more thought. The rear diffuser looks like it was made in a garden shed. You can buy kits for BMW, Dodge Challengers, Lamborghini and Minis – even a Toyota Prius! Every one of them looks terrible, as you can probably tell, I am not a fan at all. Liberty Walk is a Japanese “tuner” and “luxury” body kit builder. They are based near Nagoya and started out as a used car dealer and selling custom cars. They have two sub brands: LB Performance and LB Works that provide parts and equipment. My problem is that the kits do not look luxurious at all and ruin all the work of highly talented designers who would have put spoilers and other aerodynamic devices on if the car needed it. In fact race teams do put extra devices on cars for track use, but these are redundant for road use, hence the original design doesn’t have them. I don’t understand the need to buy a seriously premium car and then add kits to it. For a Subaru, Toyota or Mazda, maybe, but not a Lamborghini or Ferrari. Clearly people buy these kits and make beautiful cars fat ‘n’ ugly. Perhaps I’m an old codger or a traditionalist or simply a realist that loves the original designs.